UPDATE: This page has been moved, and this copy is no longer being updated. For more recent developments, see the latest version of our Encrypt the Web report. We’ve asked the companies in our Who Has Your Back Program what they are doing to bolster encryption in light of the NSA’s unlawful surveillance of your communications. We’re pleased to see that four five six seven eight companies—Dropbox, Facebook, Google, Microsoft, Sonic.net, SpiderOak, Twitter, and Yahoo—are implementing five out of five of our best practices for encryption. See the infographic. By adopting these practices, described below, these service providers have taken a critical step towards protecting their users from warrantless seizure of their information off of fiber-optic cables. By enabling encryption across their networks, service providers can make backdoor surveillance more challenging, requiring the government to go to courts and use legal process. While Lavabit’s travails have shown how difficult that can be for service providers, at least there was the opportunity to fight back in court. 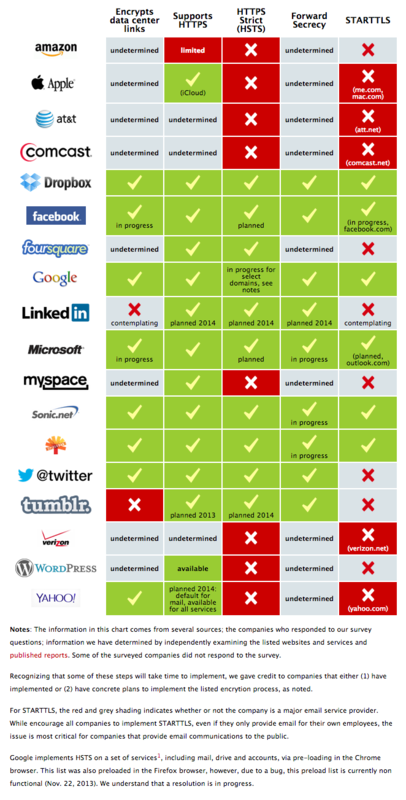 UPDATE, November 20, 2013: Facebook and Tumblr have provided further information to supplement the Encrypt the Web Report. We're pleased to report that Tumblr is planning to upgrade its web connections to HTTPS this year and implement HSTS by 2014, and Facebook is working on encrypting data center links and implementing STARTTLS. UPDATE, November 22, 2013: Google has provided further information to supplement the report on its use of HSTS. See the updated chart below and the notes for more information. UPDATE, December 5, 2013: Microsoft has provided further information, announcing a plan to expand encryption across all its services, including encrypting links between data center and implementing forward secrecy by the end of 2014. UPDATE, December 16, 2013: Microsoft has informed us that it is planning to support HSTS for public facing services that host or transmit email, personal or business documents and media, messaging, contacts, and credentials. This is an important step to make it more challenging for attackers to defeat security by bypassing encryption. In addition, Microsoft is planning to roll out STARTTLS in its outlook.com email service. This means that emails between outlook.com users and other email services that use STARTTLS, like Gmail, will be encrypted in transit. UPDATE, December 19, 2013: An earlier version of this report incorrectly stated that the HSTS preload list in Firefox for Google domains was non-functional due to a bug. Firefox enables HSTS preloading but intentionally rejects domains that do not send an HSTS header with expiration time greater than 18 weeks. As far as we can tell, there are no Google domains that meet this requirement. We urge Google to change their HSTS implementation so that Firefox and Opera users receive the security benefits of HSTS. UPDATE, March 13, 2014: Twitter has implemented STARTTLS for emails sent from its service to users—an especially important step, given that the contents of Direct Messages may be included in these updates. We've updated the chart to recognize their work in that category, bringing the company to a full five checkmarks. Tumblr has released optional SSL as a setting for logged in users viewing their dashboards, and plan to roll it out as a default in the next several months. HSTS support is still planned in 2014. UPDATE, April 2, 2014: Yahoo has announced a number of improvements to its security offerings, bringing it up to a full five checkmarks. Notes: The information in this chart comes from several sources; the companies who responded to our survey questions; information we have determined by independently examining the listed websites and services and published reports. Some of the surveyed companies did not respond to the survey. Recognizing that some of these steps will take time to implement, we gave credit to companies that either (1) have implemented or (2) have concrete plans to implement the listed encrytion process, as noted. For STARTTLS, the red and grey shading indicates whether or not the company is a major email service provider. While encourage all companies to implement STARTTLS, even if they only provide email for their own employees, the issue is most critical for companies that provide email communications to the public. Google implements HSTS on accounts.google.com for all browsers that support HSTS, which at the time of this writing are Chrome, Chromium, Firefox, Opera, and Safari. HSTS on other Google domains is only functional in Chrome, Chromium, and Safari. This graphic is also available as an image file. The National Security Agency’s MUSCULAR program, which tapped into the fiber-optic lines connecting the data centers of Internet giants like Google and Yahoo, exposed the tremendous vulnerabilities companies can face when up against as powerful an agency as the NSA. Bypassing the companies’ legal departments, the program grabbed extralegal access to your communications, without even the courtesy of an order from the secret rubber-stamp FISA court. The program is not right, and it’s not just. With that in mind, EFF has asked service providers to implement strong encryption. We would like to see encryption on every step of the way for a communication on its way to, or within, a service provider’s systems. All of these technologies are now industry-standard best practices. While they encrypt the communications from the end user to the server and back, the MUSCULAR revelations have shown this is not enough. Accordingly, we have asked service providers to encrypt communications between company cloud servers and data centers. Anytime a users’ data transits a network, it should be strongly encrypted, in case an attacker has access to the physical data links or has compromised the network equipment. In addition, we have asked for email service providers to implement STARTTLS for email transfer. STARTTLS is an opportunistic encryption system, which encrypts communications between email servers that use the Simple Mail Transfer Protocol (SMTP) standard. When a user emails someone on a different provider (say, a Hotmail user writing to a Gmail user), the mail message will have to be delivered over the Internet. If both email servers understand STARTTLS, then the communications will be encrypted in transit. If only Gmail does but Hotmail does not (the current situation), they will be in the clear and exposed to eavesdropping, so it’s critical to get as many email service providers as possible to implement the system. Finally, we have asked companies to use forward secrecy for their encryption keys. Forward secrecy, sometimes called ‘perfect forward secrecy,’ is designed to protect previously encrypted communications, even if one of the service providers’ keys is later compromised. Without forward secrecy, an attacker who learns a service provider’s secret key can use it to go back and read previously incomprehensible encrypted communications—perhaps ones that were recorded months or years in the past.